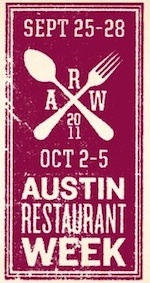 Austin Restaurant Week helps Meals on Wheels! Austin Restaurant Week is upon us! This is almost like a holiday in Austin. In Austin, we celebrate Restaurant Week for 8 days over 2 weeks. This event boasts a 3 course, pre-set menu that the chef has created for the event at a reduced rate. This allows potential patrons to take a chance on a new spot. Lord knows, I don’t want to spend my hard-earned cash on place with bad service and mediocre, high-priced food! The best part is Austin Restaurant Week benefits Meals on Wheels. In the end, when you eat, you help someone else enjoy a meal. And that is food for the soul! For a full listing of eateries, you can go to the Restaurant Week website. Hopefully, they will have the 509 [Bandwidth Limit Exceeded] error fixed. If not, you could begin your hunt for a good date for Restaurant Week!